"Simple recipe with mayonnaise, ketchup, and sweet pickle relish. I made this in restaurant quantities and broke it down. You may have to play with it to suit your tastes." In a small bowl, mix together the mayonnaise, ketchup, relish, salt and pepper until thoroughly combined, and serve. 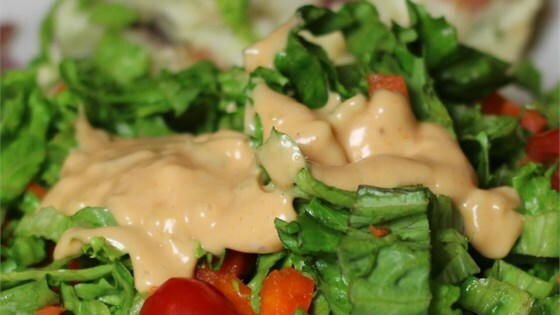 See how to make creamy homemade blue cheese dressing. easy and excellent on ruebens, which was exactly what I was looking for! Thanks Sue, you saved me from buying an entire bottle just for it to go to waste! Thank you, thank you, thank you, for the great, easy recipe. My grandma used to make this dressing when I was a little girl. Great taste. Anything this easy and good gets a 5 in my book! We made it to put on cheesburgers and it was perfect! Thanks!